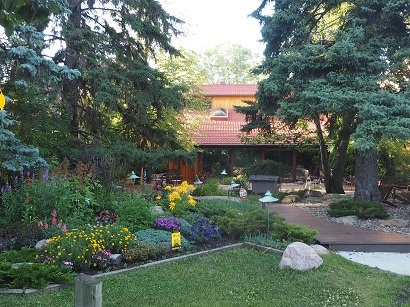 The Front Yards in Bloom recognition program is all about celebrating the efforts of our neighbours in beautifying Edmonton's neighbourhoods. Thank you for a great season - we received 5,654 nominations of blooming front yards! Feel free to browse photos of our front yard winners and finalists in all their glory. Introducing in 2018... tiny yards! 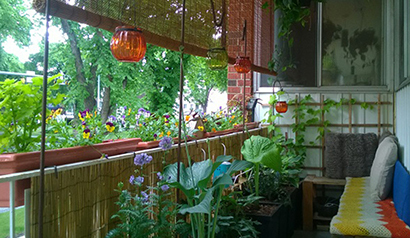 Do you have a tiny yard on your block with a beautiful garden that needs some recognition? Tiny yards can be infill lots, townhouses, duplex units, or anything that is small! An appealing front yard that catches your eye, inspires smiles, and invites visitors to enjoy its beauty! As a guideline - of all the plants found in these yards, at least 60% must be edible. 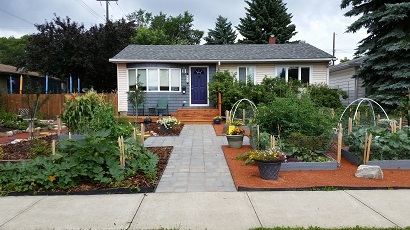 Yards in the edible category are judged by Sustainable Food Edmonton. A yard or garden with landscaping features and aesthetic appeal in front of a public building. 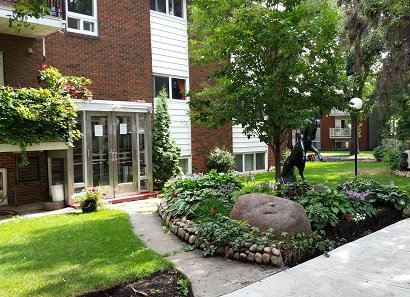 This space can be located in front of a school, business, office building, multi-unit residence, church, community league, or volunteer association. Yards in the public spaces category must be accompanied by a street address to qualify - no city parks/parkettes, median gardens and trees, boulevard plantings or shrub beds. Exceptions can be made if the citizen gardener(s) can be named along with a mailing address (email front.yards@edmonton.ca in these circumstances). Anyone can nominate a front yard. You can't nominate your own yard, but you can ask a friend or neighbour to nominate your yard. For the Balconies in Bloom promotion, we accept self-nomination in the form of photo submissions. 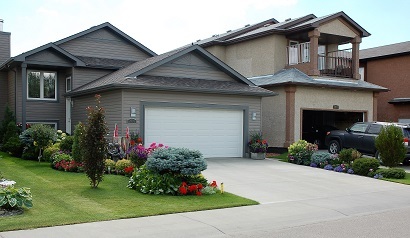 Yards and gardens should be connected or adjacent to a residence or building that has a mailing address. Please consult Alberta's Regulated Weeds list before planning your garden or nominating a garden that may include these species. 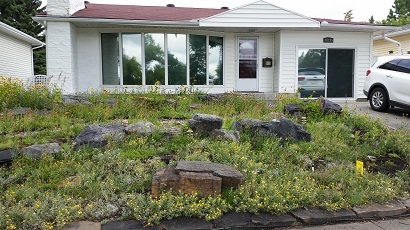 Yards with weeds may still receive a nomination sign, but volunteer judges use the presence of weeds as one of their criteria for considering a yard for an award. Front yards in bloom will have "curb appeal", and so should be in full view from the sidewalk - not hidden with wooden fence or locked gates. Yards should have easy access to the walkway of the yard for volunteers to place a sign and deliver a brochure (no locked fences or gates). Yards must contain at least 25% non-turf plants. While green lawns are quite common in Edmonton, our volunteers are placing signs only in yards where other types of plants add beauty to the area. Volunteer with Front Yards in Bloom! Help judge nominated Front Yards in Bloom or deliver and place a Front Yards in Bloom sign on a nominee's front yard and a brochure in their mailbox. For more information on the judging process and volunteer guidelines, visit our About Front Yards in Bloom section. Sign up to receive our seasonal newsletter to stay in the loop about all things in bloom. This program receives 100% funding from sponsorship and donations. Thank you to our partners, sponsors, donors and supporters! Did you know that front yards are also celebrated in the winter? Check out the Front Yards in Bloom: Winterscapes program. It's never too early to get started on your plans!